The best part....next year you can use them all over again and it will cost you nothing! 1. A “Welcome Back” color cover. 2. A “Back to School” color cover. 4. Change in Latitude! – Trade seats with a friend. 5. Class Clown Coupon – Tell the class a joke. 6. Bring a Buddy to School! – Bring a stuffed animal to school. 7. Funky Feet! – Go without shoes in the class. 9. Number One Fun! – Be first at everything for the day. 10. Share Time! – Bring something in to show the class. 11. Ready to Read! – Read to the class. 12. Hat-tastic! – Wear a hat in class. 13. Pajama-rama! – Wear your pajamas to school. 14. Lunch Buddy! – Sit with a friend at lunch. 15. Teacher Time! – Have lunch with your teacher. 16. Frozen Fantasy! – Good for one popsicle. 17. Let the Good Times Roll! - Sit in the rolling chair for the day. 18. 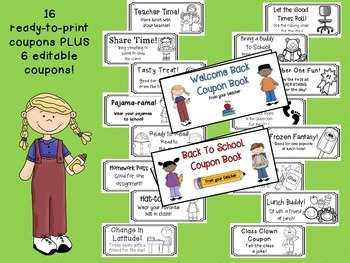 PLUS….6 cute editable coupons to make your own! For a closer look, click on the preview button above! 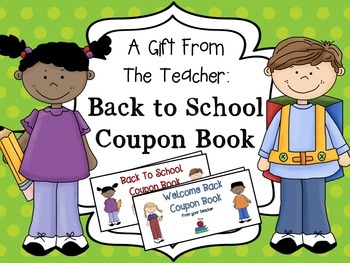 Please note: This coupon book contains the same coupons as my Holiday Coupon Book and Valentine Coupon Book but with a back to school theme. Be sure to be logged in to TPT. Then go to “My TPT” up in the right hand corner. Scroll down to “My Purchases”. This will give you a list of things you have purchased. Beside each one you will see a “Provide Feedback” button. Click this and leave feedback. You can see how many points you have earned by going back to “My TPT” and scrolling down to “TPT Credit Balance”. Redeem your points at your next checkout!